Though the 2016 Mitsubishi Outlander instantly sets itself apart with its new “Dynamic Shield” styling, which is bound to turn heads at every corner. It’s the performance, power, and refinement in delivers that truly makes it one of a kind. Toss in three rows of seating, a quiet interior, and a super-efficient transmission, the Mitsubishi Outlander is an SUV that everyone will love. The 2016 Mitsubishi Outlander has been completely redesigned and built for power, fun, and adventure! The strong 2.4L MIVEC SOHC 16-valve inline four-cylinder engine can achieve up to 31 mpg highway and 25 mpg city**. Operating on a continuously variable transmission, the 2016 Outlander generates 166 horsepower and 162 lb-ft of torque to get you through the woods, over the mountains, and across the streams! Learn about Mitsubishis AWC and S-AWC Drivetrain Technology here! The 2016 Outlander has been completely modified with striking new standard exterior features including: Color-keyed outer door handles, LED rear combination tail lights, Front grille with silver accents, Color-keyed rear bumper with silver accent, Color-keyed front bumper with silver accent, Auto-off halogen headlights, Roof carrier plug-in accommodation, Heated side-view mirrors, and LED positioning lights. If you want more impressive exterior features, take a look at some of the higher trim levels where you can find more exterior features including: Fog lights with chrome accents, Color-keyed power side-view mirrors with turn indicators, Auto-on/off headlights, Power folding side-view mirrors, Black roof rails, Power glass sunroof with tilt and slide and one-touch open/close switch, Rain-sensing windshield wipers, and/or Silver roof rails. 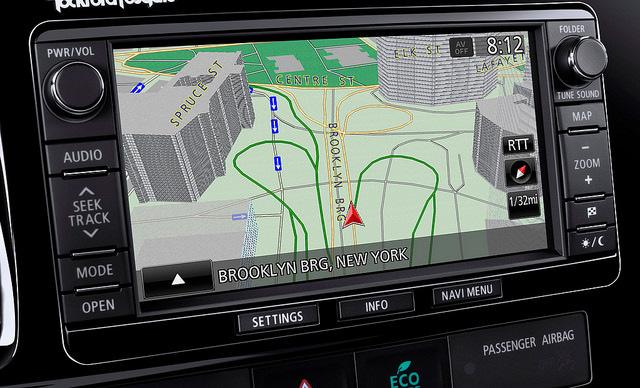 Find all of the exterior features you need to keep you and your family safe on the road while driving in style! 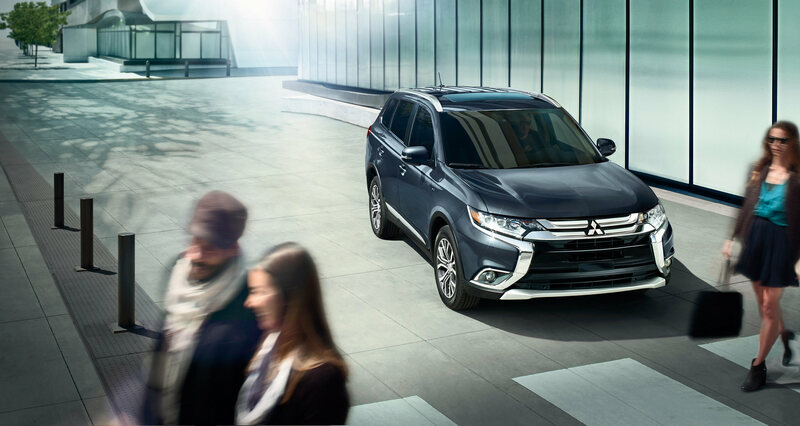 The 2016 Mitsubishi Outlander has even more impressive interior designed to keep you happy! 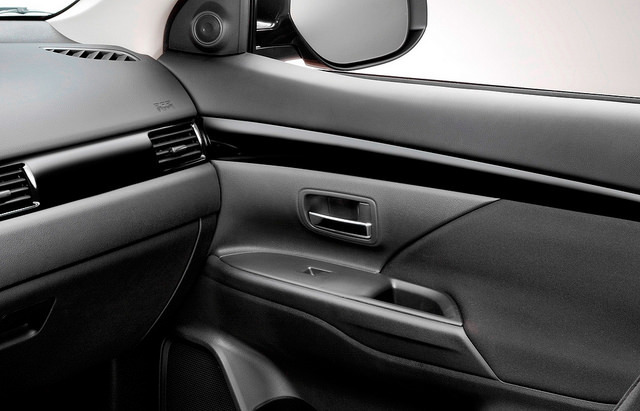 The 2016 Mitsubishi Outlander comes standard with convenient interior features including: Leather-wrapped shift knob, Gloss black instrument panel, Second row 60/40 split fold-down rear seats with independent slide and reclining adjustments, Leather-wrapped steering wheel, Six-way adjustable driver’s seat, 50/50 third row flat fold-down feature, Four-way adjustable front passenger seat, Rear cargo area light, Monochromatic multi-information display, Automatic climate control, Underfloor cargo area storage, Seven-passenger seating, ECO indicator light, and Rear heater floor ducts. Stay entertained and comfortable with standard radio and technology features including: Two 12-volt accessory outlets, 140-watt AM/FM/CD/MP3 audio system with six speakers, Remote keyless entry with panic feature, Steering-wheel-mounted audio controls, Power door locks and side-view mirrors, Cruise control, ECO Mode switch, FUSE hands-free Link System® with USB/iPod® port, and Power windows with driver’s side auto up/down feature. On higher trim levels you can find interior features such as: 3 Color multi-information display, Front dual-zone climate control, High-contrast meter gauge cluster, Leather seats, Eight-way power adjustable driver’s seat, Drive mode selector, and more! On these higher trim levels, the radio and technology more advanced too! Sit back and enjoy the following features: 6.1-inch touchscreen display with rearview camera, FAST-Key passive entry system with panic alarm feature, One-touch Start/Stop (OSS) engine switch, Digital HD Radio®, DTS® Neural Surround, PremiDIA-WIDE surround and Dolby® Volume, Power remote liftgate, SiriusXM® Satellite Radio with three-month pre-paid subscription, Auto-dimming rearview mirror with Homelink® universal garage door opener, and/or a 710-watt Rockford-Fosgate® premium sound system with nine speakers and 10-inch dual-voice coil subwoofer with Punch Control®. Some of the standard safety features on the 2016 Mitsubishi Outlander include: Hill Start Assist, Anti-lock Braking System (ABS) with Electronic Brakeforce Distribution (EBD) and brake assist, Active Stability Control (ASC), Traction Control Logic, Tire Pressure Monitoring System, Seven standard airbags including drivers knee airbag, Front seat-mounted side airbags, and Advanced dual-stage SRS front airbags, Three-point seatbelts and head restraints for all seating positions, Height adjustable front shoulder belts with pretensioner, LATCH child-restraint system, Child safety rear door locks, Anti-theft security alarm system, Anti-theft engine immobilizer, RISE body construction, and Front pedestrian impact crumple zones. With a list of over 100 improvements and an even more impressive catalog of features and amenities, the 2016 Mitsubishi Outlander is more than prepared for any challenge you might throw at it. We know you’ll think so too when you try it out at Carriage Mitsubishi! *Manufacturer’s Suggested Retail Price including destination and handling. Excludes tax, title, license etc. Retailer price, terms and vehicle availability may vary. See your Mitsubishi retailer for details.